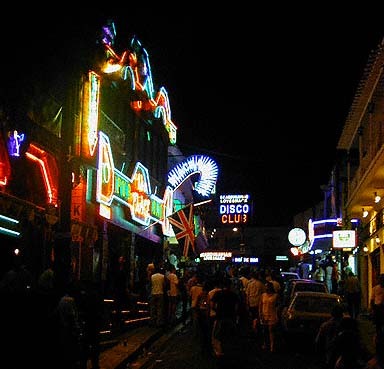 Ayia Napa is a Night City, well, it is also a day resort, but at night there is so much to see and do that you will not explore it all in a week. We occasionally take the excuse that we need to update the site and do a little sortie to check out the night life, the results are below, entrance prices and opening times, which are completely out of date because this year they will be in Euros and we don't know what they are yet. (Another good excuse for a night out (:o)) Rather than change the prices to Euros we will leave them here until the clubs open, then we will be able to see the true rate of inflation as opposed to the published figures! 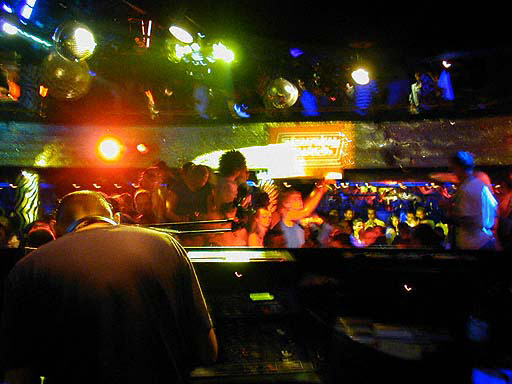 the pics are here of Ayia Napa clubbing. These are some of the clubs .... Your mission is to try them all and report back with your findings....prepare to beam up. Great atmosphere, brill setting, keep cool with a water pistol. Flintstones hangout, great for a sing song. Top of the square turn left, then its on the right. There is one in Protaras on the main rd. Larnaca had a great Hard Rock but it was fake. Find the Laiki Yitonia for the action in Larnaca now. Big with a Castle theme. They were the only club that wouldn't let us in to photograph or answer any questions about prices, times etc. Cool and big (650) dance floor. Can get wet! but it's fun. To chat with others heading for Napa this year hit his link. Don't be afraid to get club tickets from the touts on the street, they are often cheaper than on the door at night. Do not be bulled or bullied by the reps, there is a party boat too that can be a laugh, not for the modest or prudish though. Then there are the after club clubs like River Island Reggae, which doesn't even get going until the other clubs are closing down. We would really like your opinion of the best clubs and bars in Napa, so come on get writing, just put it on an e mail and send it to us. Any stories that you gathered on your holiday, random acts of kindness, experiences? Blue Moon (for the Scandinavian tourists) I think this is what used to be systembolaget ------! few tourists who are staying at Napa Plaza hotel. Grease, faces, mythology, legends, inferno, and emporium are all closed, and have been for at least 1 year. 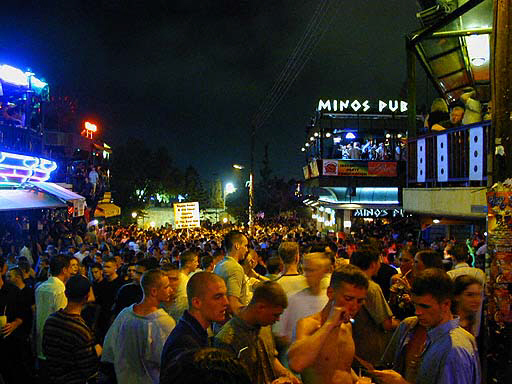 No there isn't a gay bar or gay club in Ayia Napa yet, we did seriously consider opening one as there are certainly enough visitors coming, judging by the number of enquiries we get asking that very question. Well the nearest place is Larnaca, which will take you 30 to 35 minutes in a taxi. on like it or hate it. have fun. If you are looking for Daytime Entertainment, take a look at Cyprus - adventure which covers all outdoor activities from diving, climbing, trekking, fishing, climbing, skiing, water skiing, horse riding, bicycle trailing, kayaking, yacht chartering and sailing and more, gosh it makes you tired just reading it. and to know what concerts, theatre exhibitions etc are on take a look at Cyprus-art.com which is updated on a Friday and carries all the cinema listings, workshops and general events on the island.